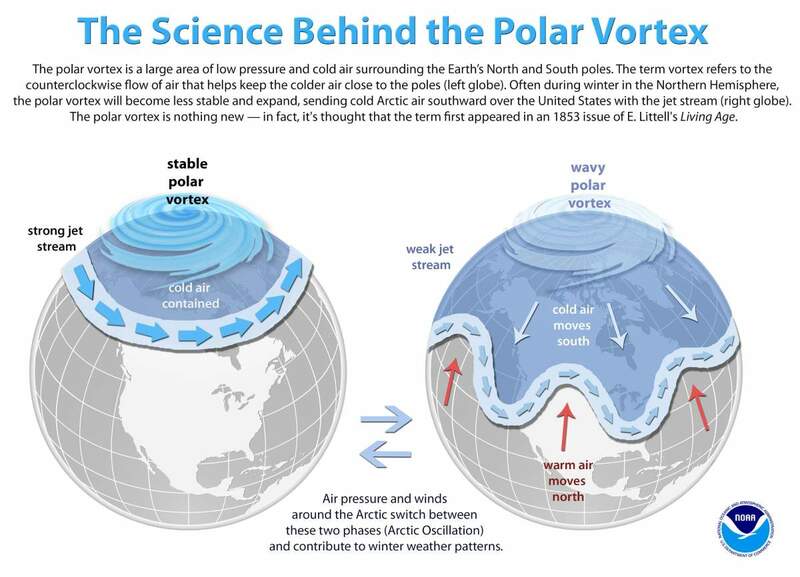 The term “vortex” refers to the counterclockwise flow of air that helps to keep the colder air close to the poles. Often during the winter in the northern hemisphere, the polar vortex will become less stable and expand, sending cold Arctic air southward over Canada and the United States with the jet stream. The polar vortex is nothing new – in fact, it’s thought that the term first appeared in an 1853 issue of Eliakim Littell’s long-lived periodical named Littell’s Living Age (1844-1941). Air temperatures at 2 meters (around 6.5 feet above the ground) at 09:00 Universal Time (4 a.m. Eastern Standard Time) on January 29, 2019, as represented by the Goddard Earth Observing System Model. GEOS is a global atmospheric model that uses mathematical equations run through a supercomputer to represent physical processes. The animation shows the same model data from January 23-29. The figures above are not traditional forecasts, but a reanalysis of model input—that is, a representation of atmospheric conditions on those days. Measurements of temperature, moisture, wind speeds, and directions, and other conditions are compiled from NASA satellites and other sources and then added to the model to closely simulate observed reality. Note how some portions of the Arctic are close to the freezing point-significantly warmer than usual for the dark of mid-winter-while masses of cooler air plunge toward the interior of North America. You can almost feel that cold in this natural-color image, acquired on January 27, 2019, by the Moderate Resolution Imaging Spectroradiometer (MODIS) on NASA’s Terra satellite. Cloud streets and lake-effect snow stretch across the scene, as frigid Arctic winds blew over the Great Lakes. In recent years, scientists identified interactions with Arctic sea ice decline, reduced snow cover, evapotranspiration patterns, NAO anomalies or weather anomalies which are linked to the polar vortex and jet stream configuration. The general assumption is that due to global warming, reduced snow cover and sea ice reflect less sunlight and therefore evaporation and transpiration increases, which in turn alters the pressure and temperature gradient of the polar vortex, causing it to weaken or collapse. That’s what happened in early 2014. The polar vortex suddenly weakened, and a huge high-pressure system formed over Greenland. The high-pressure system blocked the escape of all that cold air in the jet stream and allowed part of the polar vortex to break off and move southward. Places as far south as Tampa, Florida experienced the wrath of this wandering polar vortex. Most of Canada and parts of the Midwestern United States had temperatures colder than Alaska at the height of this cold snap! Also in this winter (January 2019) temperatures drop to as low as -46 °C (-28 °F) in Chicago. This is even colder than the Arctic! The extreme cold weather was felt nearly across the entire North America continent. It’s also important to remember that not all cold weather is the result of the polar vortex.